Our kennel name comes from a combination of our boys parent's breeders. 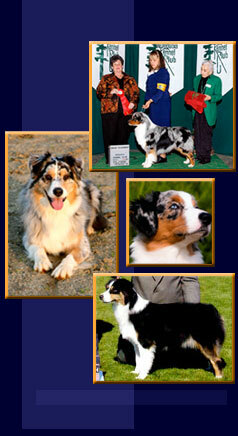 Blue Isle and Tri-Ivory Australian Shepherds. Both these kennels have produced outstanding dogs over many years. They are our friends and are great inspiration for us. All our dogs are usually owner handled, occasionally a friend will lend a helping hand. Because our dogs live an active part of our lives here at IvoryIsle we maintain a small kennel. Some of our dogs listed on our site play an important role in our kennel but may not reside with us. It is important to us to maintain a managable number of dogs in our home. I think some of my favorite moments with my dogs is when we are just playing around at the park. Each has their own unique personality that flourishes in our home environment.